The Payment Voucher PV(C) (rtf 293k) form is used for consultants, Right of Way and construction payments. For all other payments, please use the Payment Voucher PV form. Shaded areas (A-H) are required to be completed by Payee. Complete the payee identification field with the federal employer identification number assigned to the business or the social security number if the payee is an individual. Note: You must be registered with the State of New Jersey Department of Treasury in order to receive payment. Contract Agreement date, Agreement Number assigned within contract and Contract identification number are in the Executed Contract Agreement. Enter the total amount of this payment voucher. 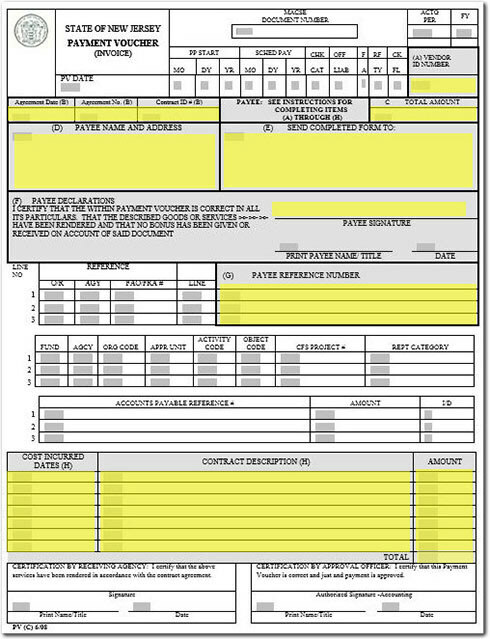 The name of the individual or company to whose name the check shall be drawn and the complete address where the check shall be mailed. Division or Bureau to whom the services were furnished. Forward two copies of the invoice to the appropriate Contract Manager as noted in the Executed Contract Agreement. Payee must sign the declaration and date the payment voucher. Print name and title. Payee must show its own invoice or billing number or any other identification for reference purposes. This information is recorded on the check stub and aids the payee to identify the invoices which have been paid. Do not use more than 30 characters and must be unique. Cost incurred dates and description of work performed, including task order number or extra work modification number, UPC Code if available. To insure prompt payment, send the completed Payment Voucher PV(C), with supporting summaries and progress report and be sure to include payee signature. Vendors may be entitled to interest on properly executed submitted payment vouchers that are past the State of New Jersey's deadline for eligible statutory prompt payment interest.